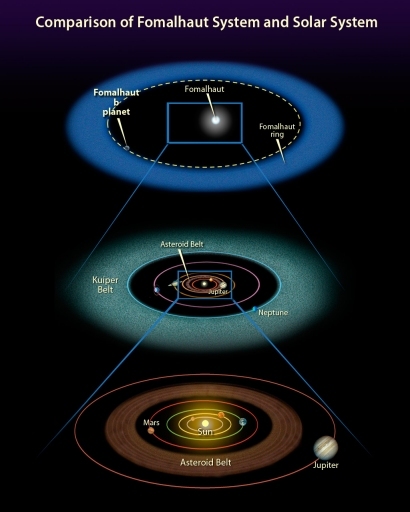 This illustration shows the size of the debris disc observed around the star Fomalhaut, as compared to the size of the Kuiper Belt and Asteroid Belt in the Solar System. The upper image shows the star Fomalhaut surrounded by its debris disc, which is located at a radius of about 130 astronomical units (AU) from the star. A candidate planet, Fomalhaut b, detected around the star in 2008, is also indicated; this detection is, however, still under debate. The central image shows the outer Solar System, with the Kuiper Belt, a rich reservoir of icy objects located beyond the orbit of Neptune and thought to be the source of short-period comets. The Kuiper Belt extends from 30 to 50 AU from the Sun. The lower image shows the inner Solar System, including the asteroid belt, which is located between the orbits of Mars and Jupiter and extends from roughly 2 to 4 AU from the Sun.